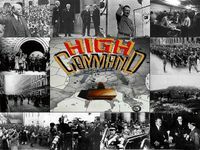 High Command captures WW II in Europe on a grand scale. Spanning the war years 1939 through 1945, you are placed in complete control of all military, economic and political resources. Lead the Allied or AXIS War Machine. Command all Land, Sea, and Air Forces. Exercise all diplomatic options. Build up your military might or invest in your country's infrastructure. High Command is more than a wargame. This is the ultimate hot seat!